also known as Thomas Fanger and Michael Kersten. This German duo is known for Berlin School tendancies as well as more dance oriented music. Both types fit very well on Galactic Travels. consisting of Andy Bloyce (UK), Tom Coppens (Belgium), Ruud Heij (The Netherlands), and Jens Peschke (Germany). This pan-European group creates Berlin School music of the highest caliber, adding their own personal stamp. The members of the band can be found hanging around at the beyond_em mailing list. Robert Scott Thompson works in the electroacoustic, contemporary instrumental, pop and avant-garde genres. As Associate Professor of Music at Georgia State University in Atlanta, Dr. Thompson is Director of the Center for Audio Recording Arts (CARA). He runs the Aucourant Records label which has released selections of his work in a wide range of styles. He has also released music on the Mirage label. Robert Rich, famous for his sleep concerts, has released a seven-hour DVD entitled SOMNIUM. It is possibly the longest continuous musical composition ever released on any format, representing an ambient music landmark. Although Somnium was designed to be heard at any hour, at any volume, it works best quietly at night. The best listening levels are obtained by adjusting the first 10 minutes of SOMNIUM so that it plays at a soft, comfortable volume for falling asleep. The environmental sounds during these opening minutes should be nearly inaudible. The music gradually slows down and becomes quieter during the first hour, so that when you are sleeping, it should be soft enough to hover just at the edge of awareness. One autographed copy of this standard DVD-video format, playable in all DVD players, was given as a thank you gift in return for a pledge of $150 shortly after the presentation during NPR's Morning Edition. Check out the Stereophile article about SOMNIUM. James is from near the Chicago area, close to the Wisconsin border. Yet his music is known the world over in ambient circles. He has collaborated with Ma Ja Le and, most recently, Stephen Philips. And, of course, he is a solo artist. His music ebbs and flows, engulfs your senses, and washes over your emotions. All these facets were explored on his CDs from labels like Zero Music and Hypnos. These UK concerts, organized by SMD, take place in a planetarium among an array of radio telescopes. This special place seems to imbue EM concerts with a special aura. Each week's Feature CD at Midnight was by a different band from the Neu Harmony (see also Neu Harmony) six CDR set, "Concerts at Jodrell Bank." Since the Kubusschnitt disc has already been a Feature CD at Midnight and there are only five Thursdays this month (there are never six! ), this disc was not featured again. This German trio records on Torsten Kuhn's Invisible Shadows record label, producing dynamic electronic music influenced by Jean Michel Jarre, Tangerine Dream, and Klaus Schulze. Andreas Morsch, Uwe Denzer, and Axel Stupplich have a history that goes back to 1988 when Axel and Andreas met through a common friend. After some success, Andreas stopped making music due to health reasons and Axel went it alone. In 1995, Uwe joined Axel and they took on the name of Pyramid Peak. Andreas returned to the band in the summer of 1998. The Ministry of Inside Things are considered among the most innovative of US electronic musicians today. Influenced by the early music of Tangerine Dream, Klaus Schulze and Ash Ra Tempel, their spacemusic is linear, leading the listener across many sonic terrains. Based on improvisation, The Ministry of Inside Things creates electronic realizations that flow from theme to theme, with the experience often lasting up to two hours. Through the use of textures and atmospheres as well as harmony, rhythm and melody, the group transports the audience on an internal sonic excursion. Chuck is well known as the host of the long-running and popular show Star's End and the producer of The Gathering Concert Series. 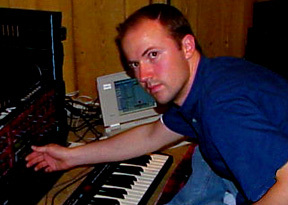 He and Peter have been recording electronic music and performing live for more than 15 years, including a collaborative CD, Regeneration Mode on the Synkronos label. Peter was a member of The Nightcrawlers, whose LPs from the '80s have been documented by the Travelling Backwards CD on the Manikin label. Art Cohen has been pushing the limits of the electric guitar in the studio and in live performance for well over 15 years. Steve Dinsdale, Duncan Goddard, and Gary Houghton create and record their music in the moment that it happens without multi-tracking or overdubbing. Their sound is one of music evolving before your very ears. Rather than using drum machines, their hypnotic rhythms are created by analogue sequencers manipulated in real time to create a constantly shifting base, in a conscious move away from dance oriented music. Pete Namlook is the artist name used by Pete Kuhlmann. He owns and operates the FAX label which releases his own music as well as the music of many other fine artists. FAX is an experimental German electronic music label started in 1992 by Peter Kuhlmann. (Kuhlmann = "Cool Man" in German; therefore Namlook is Cool Man backwards!) Music released on FAX showcases artists who draw from elements of Brian Eno's ambient music, the structure of 70's Progressive Rock, old Tangerine Dream space music, techno (Intelligent Dance Music), and environmental soundscapes. FAX is distributed in the USA by Ear Rational, a mail order service. In October, two bands on the Quantum label visited America. Wave World brought their multimedia show to America for the first time. Wave World's show is a synthesizer and computer based musical project which includes computer generated video. 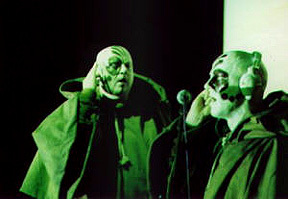 Members Gert van Santen and Harry Kessels perform the music wearing hooded robes and eerie make-up while Rolf van Slooten's video wizardry is projected for extra visual impact. Free System Projekt has been to the USA twice before when Marcel Engels attended and performed at the Okefenokee event. A wonderful CD of the 2000 event, Okefenokee Dreams, is soon to be followed up by a CD of the 2001 event. Both CDs feature Marcel. For this tour, Marcel was joined by Ruud Heij (of Kubusschnitt and Patchwork) and Frank van der Wel who has a few solo CDs on the Quantum label himself. In response to some cancelled and postponed EM festivals in Europe this Fall, Steve Jenkins took it upon himself to organize a one day festival. As a result, Under the Dome, Free System Projekt, Radio Massagre International, Headshock, and AirSculpture all performed on Saturday, October 27, 2001, at the Millenium Hall in Liphook, Hampshire, UK. I caught these performances on minidisc and presented one group per week in place of the Featured CD at Midnight during November. Many thanks to Andy Bloyce who did the actual engineering to allow me to enjoy the concerts. Many of the musicians and audience members belong to Beyond EM, a Yahoo group mailing list for discussing electronic music. The messages and photos folders contain reviews, impressions, and pictures of this fabulous event. 1 A technical glitch prevented the use of the minidisc player. A CD of a live show by AirSculpture was substituted at the last minute. The AirSculpture set was rescheduled for the 29th. This local band is from nearby Quakertown. Originally founded in 1979, the year when Skylab's orbit decayed, causing a firey return to Earth, guitarist Scott Watkins and synthesist Terry Furber formed a band influenced by the likes of Tangerine Dream, Klaus Shulze, and Pink Floyd. Today, Terry and new guitarist Tim Richardson make electronic space music with the improv and energy of fusion styles from the 70's. As a special holiday treat for the listeners of Galactic Travels, Orbital Decay performed a live, in-studio, on-air concert during the 12-27-01 program. 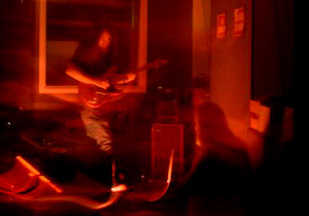 This event marked Tim Richardson's debut as Orbital Decay's new guitarist. For more information about Orbital Decay, visit the artist profiles area.